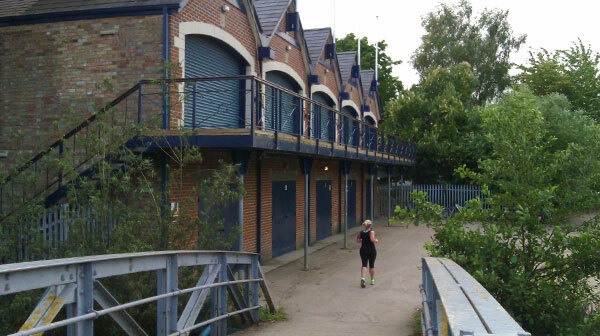 Longbridges Boathouse, Oxford, OX1 4UW is where we meet on most Saturday mornings throughout the year at 9.15am. If you would like take part in Saturday rowing, please contact us to say you are coming. Longbridges is on the Thames towpath half way between Folly Bridge and Donnington Bridge. Please be aware that there is no public access by car. The best access is on foot, or by bike from Central Oxford. Access the Thames towpath at Folly Bridge, at the North end of Abingdon Road and the South end of St. Aldates Road. Walk south from Folly Bridge, downstream, along the towpath for 12 minutes. Pass a large modern dark angular boathouse at about half way (University College boathouse). Arrive at the next boathouse which is Longbridges boathouse. Access the Thames towpath from the South side of Donnington Bridge, Wier Lane. Walk northwards on the towpath. After 7 minutes walk, cross two small footbridges and you will be beside Longbridges boathouse. There is no direct access to Longbridges Boathouse by car but the nearest free parking is only 7 minutes walk away. Approaching from the south by car, turn off the Oxford outer ring road at Redbridge Park and Ride (Kennington roundabout). Enter northwards towards the city centre on the Abingdon Road. At the second set of lights turn right at the T-junction into Wiers Lane. Go over Donnington Bridge then turn immediate left at the end of the bridge into Meadow Lane. 50 metres on the left go under a metal frame into an earth and grass car park which is free parking. Walk back over the bridge, crossing the river and turn right, and northwards, onto the towpath. Please beware that parking in the city centre of Oxford is expensive and limited.